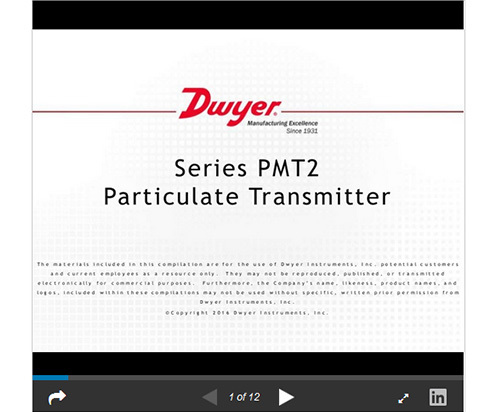 The SERIES PMT2 Particulate Transmitter is designed to measure particulate emission levels from dust collector discharge. Using DC coupled electrostatic induction sensing technology, the transmitter monitors a pA current that is generated as particulate passes near the probe; a 4 to 20 mA signal will vary based on the particulate level. The PMT2 offers 6 sensitivity ranges allowing the user to choose the range that will best fit the application. The range and test selector switch can also be set to output a 4 mA or 20 mA signal to assist with set up or trouble shooting. Averaging time setting can be used to dampen the signal if desired. Air and compatible gases, any type of particulate conductive or nonconductive. 316L SS, silicone, and PTFE. 5 to 5000 pA (6 selectable range options). Ambient: -40 to 145°F (-40 to 63°C); Process: -40 to 248°F (-40 to 120°C). Two 1/2" female NPT conduit openings. Removable (16 to 20 AWG wire). 1 to 360 s (10 selectable options). Varies with length of probe and type of mount. CE, cULus; ATEX Compliant: 0518 II 1 G Ex ia IIB T4 GA (-40°C ≤ Tamb ≤ 63°C) (-40°C ≤ T Process ≤ 120°C) / II 1 D Ex ia IIIC T120°C Da (-40°C ≤ Tamb ≤ 63°C) (-40°C ≤ T Process ≤ 120°C). Type Certificate No. : DEMKO 16ATEX1768 X. ATEX Standards: EN 60079-0:2012/A11:2013; EN 60079-11:2012. IECEx Certified: Ex ia IIB T4 Ga (-40°C ≤ Tamb ≤ 63°C) (-40°C ≤ T Process ≤ 120°C) / Ex ia IIIC T120°C Da (-40°C ≤ Tamb ≤ 63°C) (-40°C ≤ T Process ≤ 120°C). Certificate of Conformity: IECEx UL 16.013X. IECEx Standards: IEC 60079-0: 2011; IEC 60079-11: 2011. UL Listed Intrinsically Safe for Class I, Groups C and D; Class II, Groups E, F and G; Class III; Class I Zone 0 AEx ia IIB T4 Ga; Class I Zone 0 Ex ia IIB T4 Ga.